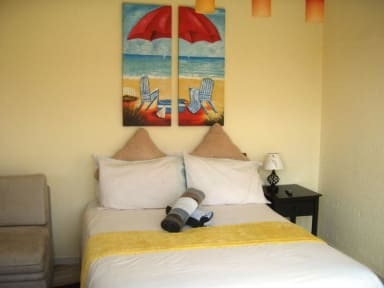 If you are looking for a guest house where you can catch your breath, enjoy superb tranquillity and experience real South African hospitality, look no further than Gold Reef Place. There is a cosy lounge with a fireplace. Breakfasts are served in the guest dining room. There is a well equipped modern kitchen for self-catering. 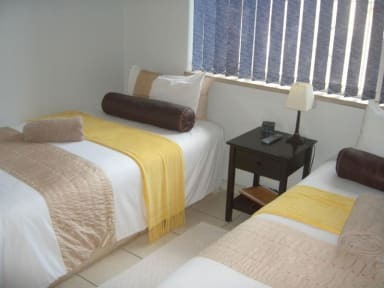 We offer you a peaceful stopover whether you are in the area on business or pleasure. Gold Reef Place is within walking distance of Gold Reef City Casino and Theme Park as well as the Apartheid Museum. We are 6kms from FNB Stadium, also known as Soccer City and The Calabash, it is a stadium located in Nasrec, bordering the Soweto area of Johannesburg, and the Johannesburg Expo Centre – which is South Africa's largest purpose-built exhibition, conference, convention and events venue. Modern and clean rooms with a cosy dining area will make you feel at home. Rooms are serviced daily. Special requests are welcome, ensuring your stay with us is comfortable. Between 21st December 2018 and 6th January 2019 our prices will exclude breakfast.